The Security Agencies must be given marching orders to curtail the sustained killings of Nigerians across the country and protect life and properties of Nigerians as this is the primary duty of any responsible Government. 2. The systematic harassment and humiliation by the Executive of perceived political opponents, people with contrary opinions including Legislators and Judiciary by the police and other security agencies must stop. 3. There must be strict adherence to the Rule of Law and protection for all citizens by the President and his appointees. 4. The President must be held accountable for the actions of his appointees and must be ready to sanction those that carry out any act which will ridicule or endanger our country and democracy. 5. The Government should show sincerity in the fight against corruption by not being selective also prosecute current appointees that have cases pending against them. 6. The sanctity of the National Assembly should be protected and preserved the Federal Government of Nigeria by not interfering in its business and prosecuting those who invaded the Senate to seize the mace. 7. a. National Assembly should liaise with International Communities through the IPU, APU, ECOWAS, CPA, Parliament, Pan African Parliament, EU, UN, US congress and UK Parliament to secure our democracy. b. Democratic elections must be competitive and inclusive by removing the present reign of fear and intimidation particularly as we approach the forthcoming 2019 elections. 9. The President must take immediate steps to contain the growing level of unemployment and poverty in Nigeria especially now that we have advantage of the oil price having risen to $80 per barrel. 10. 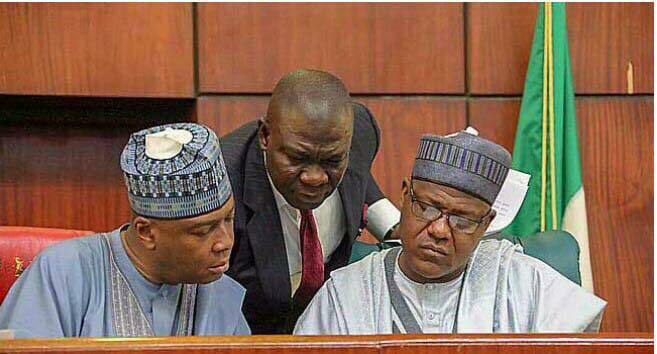 Both chambers of the National Assembly hereby pass a vote of confidence on the Senate President and the Speaker of the House of Representatives and the entire leadership of the National Assembly. 11. we reaffirm our earlier resolution of vote of no confidence on the Inspector General of Police who does nothing other than preside over the killing of innocent Nigerians and consistent framing up of perceived political opponents of the President and outright disregard for constitutional authority, both executive and legislative. BUHARI SERVES A WEEK ULTIMATUM ON SERVICE CHIEFS.